The College’s most important high school visitation weekend began Friday as staff, faculty and students welcomed up to 400 high school seniors to the Wabash campus. See photos here. It’s the 118th year for Honor Scholarship Weekend. Students will be testing to win up to $20,000 in annual scholarships to attend Wabash. Nearly $3.5 million was awarded from last year’s Honors Weekend. While many will earn scholarships to join the Class of 2015, it’s a chance for all of the potential Wabash men to learn more about campus, spend a night or two in student housing, and get a realistic feel for college life. The students began the weekend with an activity fair in Chadwick Court. 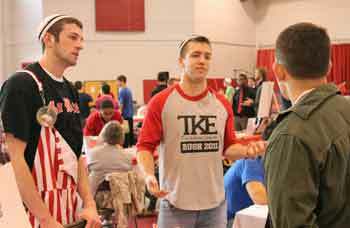 Clubs, fraternities, and many college offices have tables to introduce the seniors to Wabash life and services. 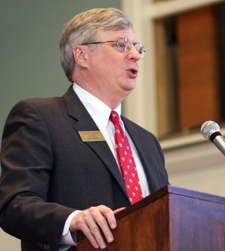 A formal welcoming program is held at 11:30 a.m. with a welcome from President Patrick White and Dean Klein. Students then hear from their potential classmates as Student Body President Steve Henke ’12, Independent Men’s Association President Rudy Altergott ’13, and Inter-Fraternity Council President Jake Moore ’11 give brief talks. The middle part of the day is designated for testing. Students will be joined by Wabash alums at dinner before fraternity and residence hall tours and a concert in Salter Hall. Saturday’s schedule isn’t quite as busy but still full of activities. The morning kicks off with more testing and then a quick lunch. The afternoon schedule is largely open. Many students will want to attend the Inaugural Baseball Game in the new Wabash stadium. First pitch vs. Wilmington will be at 1 p.m.
Saturday night features Mission IMPROVable, a Chicago-based improve comedy troupe in Ball Theater at the Fine Arts Center. The weekend is not only important for the students, but annually a large portion of the incoming class will have attended Honor Weekend. Join the Wabash College Class of 2015 page by clicking on the logo.